TSLPRB Police Constable Prelims Answer Key, Submit Objections 2018,Telangana State Level Police Recruitment Board issued a Notification on 31-05-2018 for direct recruitment of 16,925 vacancies of SCT PCs Civil and / or equivalent Posts. 4,79,158 Candidates have registered for the said Recruitment and after de-duplication of Applications, total Candidates that were to take the Preliminary Written Test were 4,78,567. The Preliminary Written Test for the Recruitment of SCT PCs Civil and / or equivalent Posts has been conducted in 966 Examination Centres located in 40 Places (almost all the important Cities and Towns) throughout the State from 10 am to 1 pm, on 30-09-2018. Telangana state level police recruitment board on 05-10-2018 released the preliminary answer key of the examination to recruit Stipendiary Cadet Trainee (SCT) Police Constable (PC) civil and some other equivalent posts. The preliminary written test (PWT) to fill 16,925 tentative vacancies was conducted on September 30 from 10am to 1pm. The PWT to recruit SCT Police Constable civil and some other equivalent posts was held at 966 exam centres located in 40 places in Telangana. Out of 4,79,158 candidates who registered for the exam 4,49,584 (93.95 %) appeared in the written test. TS Police Constable answer key 2018: Candidates can check the answer keys by clicking here. Candidates can raise objections, if any, against the TS police constable exam preliminary key for each question individually in the web template made available to them in their respective accounts. Every individual (question) objection, has to be submitted separately, by mentioning the details in the given proforma. Objections with insufficient information will not be considered. No manual representations will be entertained in this regard. The objections should be submitted by 5pm on October 8. The PWT was of three hours duration and carried a maximum of 200 marks. The exam was objective in nature and of intermediate standard. The questions were to test candidate’s knowledge of English, arithmetic, general science, history of India, Indian culture, Indian national movement, Indian geography, polity and economy, Current events of national and international importance, Test of reasoning / mental ability, contents pertaining to the state of Telangana. The minimum marks to be secured by the candidates in order to qualify in the Preliminary Written Test is 40% for OCs, 35% for BCs and 30% for SCs / STs / Ex-Servicemen. TSLPRB Answer Keys for TS Police Constable September 30 examination is released Check updates on tslprb.in. 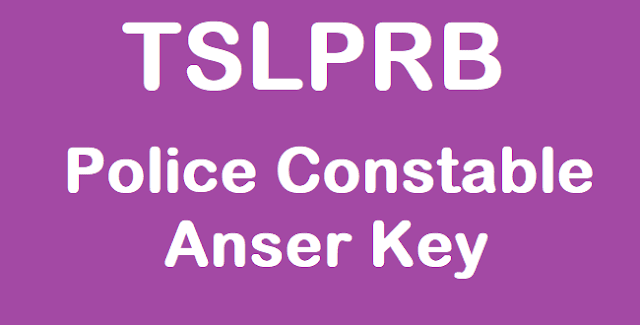 Telangana State Level Police Recruitment Board, TSLPRB is expected to release the TS Police Constable Answer Keys 2018 soon. The board is likely to release the TSLPRB Key 2018 for police constable September 30 examination by 03-10-2018. The answer keys would be released on tslprb.in. The candidates would get a window of only 3 days to submit Objections. TSLPRB has also released a small previw of the Proforma Objections. Candidates would have to login to their respective accounts to raise the objections on the Web Template. Please note, every question objections has be to submitted separately on the form. Candidates are further informed that the incomplete objections with insufficient information would be summarily rejected. Candidates are hence advised to keep a check on the official website of TSLPRB for updates on the release of the answer keys. The Preliminary Written Test has been conducted smoothly, by scrupulously abiding by all the norms and regulations, as per the planned schedule. Biometric Attendance of the Candidates, including the digital finger prints and digital photographs have been captured during the Test to facilitate conduct of further process. Preliminary Key for the above Test will be made available on the official website: www.tslprb.in within a few days (Please keep watching our Homepage). Candidates will be given 3 days’ time to submit Objections, if any, on Preliminary Key for each question individually in the Web Template made available to them in their respective Accounts. It is once again cautioned that every individual (question) objection, has to be submitted separately, by mentioning the details in the above Proforma. Objections with insufficient information will not be considered. No manual representations will be entertained in this regard. The candidates, who had registered for the exam, appeared for preliminary written examination for the recruitment of Stipendiary Cadet Trainee Police Constable (PCs) Civil or equivalent posts. Candidates took the test in 966 examination centres across the State from 10 am to 1 pm. A preliminary key would be made available on the official website www.tslprb.in within a few days. Candidates would be given three days to submit their objections, if any on the preliminary key. The Telangana State Level Police Recruitment Board (TSLPRB) to be released the Telangana Police Constables answer keys on the official website tslprb.in. The PWT or Preliminary Written Test Answer Key to be available on tslprb.in. Candidates who appeared for the examination can check the answer keys and raise objections.